The Arctic pool of air brought down by the Northerlies through Thursday is due to develop into a cool pool of LOW pressure over the continent which will linger and flirt with the South East of the UK for this weekend. While the North and West basks under high pressure, the South is due for some cool brisk winds and some persistent rain at times this weekend: wind then rain on Friday, rain on Saturday. This will blow the cobwebs away (and some leaves!) after the balmy start to October. Significant rainfall total over 20mm on places. The wind starts first as a brisk cool Northerly on Thursday and Friday morning and then swinging round to a cool North Easterly during Friday with gales possible in the Channel and North Sea with 30mph+ gusts for Reigate. 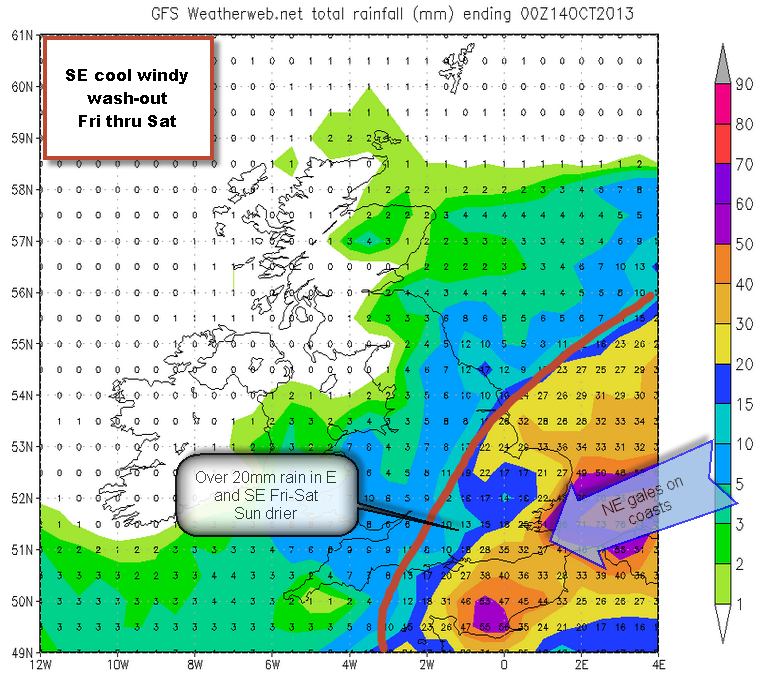 Friday pm will see the rain setting in, possibly quite late into the afternoon for Reigate. The rain is associated with complex fronts wrapped around the LOW pressure moving unusually SW across Northern France from the Netherlands. Once the rain arrives on Friday, it is likely to remain persistent until well into Saturday. Some significant totals are possible with moderate intensities on Saturday morning. With the wind it will feel distinctly cool and autumnal compared to last weekend when 20c was exceeded in Reigate. A Nor’easter is actually a storm off the coast of New York / Eastern USA which brings in cold blast of NE winds on the back of a depression circulation. This is like a mini-nor’easter but is tracking the wrong way.